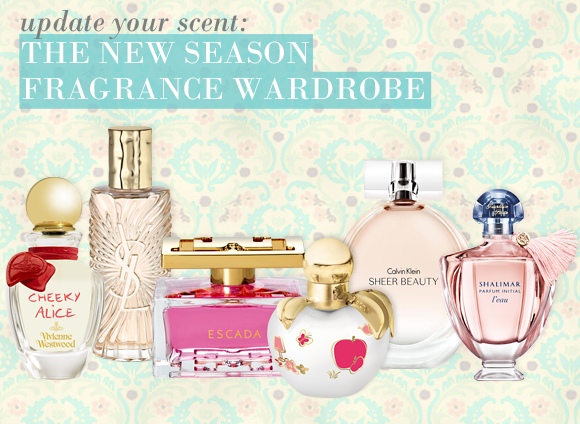 Now that the end of winter is in sight, it’s time to start thinking about updating your wardrobe – your fragrance wardrobe, that is. The heavier scents of winter can be a little rich for the fresher spring months, so choose a fragrance that is as bright and breezy as the change in the weather. A bewitching transparent floral scent with a mischievous twist, Cheeky Alice shimmers with femininity and confidence. Airy lily of the valley meets with fresh peony and a touch of blushing rose for a crystalline sillage. Inspired by the iconic YSL laced safari jacket of 1968, ‘The Saharienne’, this light yet warm solar fragrance captures the thrill of adventure. The radiant scent brings together the freshness of citrus with a luscious floral heart and just a touch of spice. This utterly feminine scent is a joyful expression of Escada style. A feel-good composition of dewy rose, soft ylang ylang, sparkling pear and musky ambrette seeds creates an uplifting and charming feel that is just perfect for the spring. If the cute apple-shaped bottle of Nina Ricci Fantasy isn’t enough to get you in the mood for the changing of the seasons, the brightening blend of pear, heliotrope, cherry blossom, vanilla and brown sugar scent will! This pared back fragrance exudes a sense of natural confidence. Its luminous fruity floral notes of peach, pink lily and jasmine are paired with the softness of musk and vanilla for a captivating signature scent. Alighter incarnation of last year’s Shalimar Parfum Initial, this L’Eau energises the senses with an overdose of citrus notes. A powdery heart of iris, grandiflora jasmine and Damascena rose create a voluptuous feel. Love Saharienne but wish it was eau de parfume as the scent might last longer! In fairness though just because I am no longer aware of it doesn't mean that others aren't. Normally it would take me quite a long time before I would decide to buy a perfume for the first time but not with this one, tried it once and had to buy it. This entry was posted on Tuesday, February 7th, 2012 at 8:00 am and is filed under Fragrance, New products, Trends. You can follow any responses to this entry through the RSS 2.0 feed. You can skip to the end and leave a response. Pinging is currently not allowed.